Tax expenditures are measured relative to a comprehensive income tax system. If tax expenditures were evaluated relative to an alternative tax system—for instance, a comprehensive consumption tax, such as a national retail sales tax or a value-added tax—some of the 10 major tax expenditures analyzed here would not be considered tax expenditures. For example, because a consumption tax would exclude all savings and investment income from taxation, the exclusion of net pension contributions and earnings would be considered part of the normal tax system and not a tax expenditure. Economists agree that consumption taxes are better for economic growth than income taxes, and many of these big expensive tax expenditures are justified on that basis, particularly the preferential rate on capital gains and dividends. Yes, it’s a special interest in a sense that owns stock, but actually most people are exposed to the stock market directly through their retirement accounts or other investments. More importantly, the stock market affects us all ultimately as a means of connecting money and ideas, resulting in innovation, better products, better jobs, and higher living standards. So of the 10 major tax expenditures, which are truly offensive, in terms of pro-growth economics? It is actually the one that is the most expensive by far in terms of lost tax revenue: the exclusion of employer-sponsored health insurance, which is estimated to cost $248 billion in lost federal income tax and payroll tax revenue. CBO is careful to point out that this estimate, as with all official tax expenditure estimates, does not account for changes in behavior, and if it did the revenue number would be smaller. Nonetheless, this tax expenditure is unjustified since it allows a form of compensation to escape income and payroll tax, for no reason except historical accident. It has also greatly exacerbated a number of problems in the healthcare market, particularly a) runaway costs as people are incented to purchase more health insurance than they would otherwise, and b) lack of health insurance options outside of employers. The earned income tax credit and child credit are also on shaky ground. Whatever incentive the EITC gives to low-income folks to work harder it takes away at higher-income levels as it is phased out. The child credit does not really increase labor or capital, except in the long run, and it is really negligible relative to other costs, e.g. diapers. Lastly, this CBO report has lots of pretty charts showing the distribution of the top 10 tax expenditures. The benefits are certainly skewed to high-income folks: about half the benefits go to the top 20 percent of income earners. 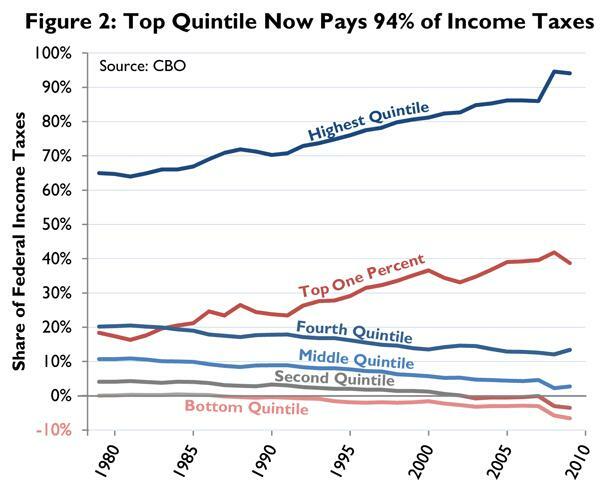 CBO is right to point out this roughly matches their share of income. But the share of taxes paid is actually more skewed: the top 20 percent of households pay 68 percent of all federal taxes and 94 percent of all federal income taxes, also according to the CBO. In other words, tax breaks benefit those who pay the taxes.